Greetings KimmyChii, I saw that you were watching a few seasonal shows. It has been an interesting two weeks. We saw the largest number of nominations we have ever seen and the introduction of a semi-final round which was exciting until the end. Now with all that it is time to vote for the Face of UAS for the Spring Season. With this our club will be redesigned to fit our new winner. Voting will take place 4/16 and last until 4/24 at 23:59 PST (MAL time). The winner will be announced on Monday 4/25 and the redesign will take place that week. Vote now and make your favorite the new Face of UAS!!! The long message is just to update you on new things going on at UAS! Ever want to follow what is going on in the club but don't really log on to MAL that much? Even if you are logged on there really aren't many notifications unless you are heavily active. Afraid that you may miss out on something big? No worries... for all things UAS follow and/or Like UAS on Twitter, Tumblr, and Facebook to stay up to date on all things UAS! More information available here! For all those who wondered it, List editions will be up to date and open again by 4/22. It has been an extensive process updating the list but one that should be well worth the wait. To those who claimed an character and/or requested a forum signature, your request has not be forgotten and will be completed within the next week or so. I apologize for the wait. The Anime of the Week process goes away and we will be introducing A Monthly Anime Feature. We decided that a week is not really a long time for our members to watch a series taking into account life, other anime you are watching, and other interest and hobbies. Therefore we decided to make the process a whole month to increase member participation. More information to come soon as we are set to begin in May. As always don't forget to be on the look out for WingKing's Short Anime Spotlight. It comes out every Wednesday, however he might throw a Monday in there every once in a while. There he puts focus on short, unpopular anime and reviews them. You have one that you want him to review, just shoot him a message and he will be more than happy to work it into the schedule. Don't forget to check out our Your Anime Collection (Reintroduced) forum to check out the members of UAS's anime collections. As well share information and trade secrets. We can't wait to see you at UAS!!! Well it is time for the start of the spring anime season and after taking a break for one season it is time once again for us at UAS to select a new Club Picture. In this forum thread nominate your favorite unpopular anime and/or character. Each member may make two nominations only. They may be anime/character, anime/anime, or character/character. The choice is yours. Nominations start Friday 04/01 and go through Friday 04/08 23:59 PST (MAL time). Shortly after a poll will be created using 6 selected nominations. If your selection isn't chosen worry not as we do this with every new anime season. (4 times a year) Who knows, maybe your nomination will be the new face of UAS!!! Hoe is het met jouuu?? 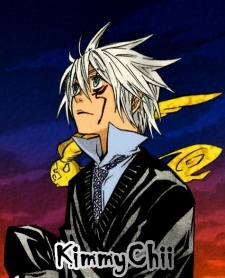 It's from God Child (direct sequel of Count Cain Series) by Kaori Yuki. Allen in your avatar is pretty cute too! Ik heb je al zoooooo lang niet gesproken!! Wat doe je zo nu en dan? Ik kan me herinneren dat je in het ziekenhuis werkte als schoonmaakster toch? Zelf doe ik een studie dit jaar. Ik doe Maatschappeljk Werk en Dienstverlening aan het HVA. Het is superieur! helaas heb ik wegens omstandigheden wel een studievertraging opgelopen. Heya, hoe gaat het met je ?? ga je ook naar tsunacon al een beetje aan het voorbereiden ?? ik ga helaas niet ik wil zo graag maar ben blut als ik weet niet wat. hoe gaat het met je egt lang niet gesproken..
sorry daarvoor ben egt blij dat je me verjaardag niet bent vergeten maakt me egt blij.